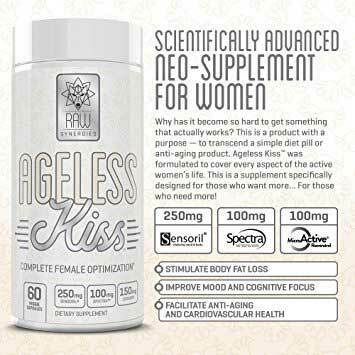 Ageless Kiss is a dietary supplement that’s that alleged to give women the complete optimization they need to unlock their “best potential self”. It’s produced by a company called Raw Synergies and sold exclusively via Amazon. We managed to locate a company website, but it doesn’t provide any company information or contact details. It’s sole purpose appears to be to drive customers to the Ageless Kiss sales page and the sales pages for the company’s two other products—a male enhancement supplement and a pre-workout powder/fat burner intended for unisex use. All of the ingredients are are commercially available proprietary blends. Sensoril (250mg): A patented ashwaganha root extract that is credited with value in many different areas including the treatment of menstrual problems, insomnia, and stress. Ashwaganha is also alleged to possess anti-ageing properties. Cognizin (150mg): A citicoline-providing ingredient. Citicoline is often added to smart drug formulations because it appears to be capable of boosting brain function and helping the cognitively impaired. Spectra Antioxidant Fruit Blend (100mg): A blend that provides a mix of 26 fruits, vegetables, and other plant extracts that are known to be rich in antioxidants and should help support good health by preventing oxidative stress. Careless Mango (100mg): A pure dried mango fruit powder sourced from fruit harvested in a state of optimal ripeness. It’s alleged to give you less reason to care about ageing and body weight, and benefit the health in many ways, but no supportive evidence is provided and its important to take note of the fact that the species of mango used is not African mango, which has much better credentials as a weight loss provider. MicroActive (100mg): A patented resveratrol extract. Resveratrol is a natural plant phenol that is present in several fruits and is generally sourced from grapes. Rodent-based research suggest it may promote fat loss and support good liver health. Cocoabuterol (50mg): A cocoa extract that’s alleged to be good for boosting energy, improving the mood and burning fat, but does not appear to have any research-backed abilities in any of these areas. Paradoxine (50mg): A patented extract taken from a plant commonly called grains of paradise. It’s a member of the ginger family and the results of a study conducted at Tenshi College, in Japan suggest it may have the ability to reduce body fat. The recommended dose is two capsules per day, taken with meals. New users are advised to take one capsule, two times per day for the first three days and monitor for tolerance issues. If all goes well, the two capsules should be taken together, once a day, from day four onwards. It’s important not to take the capsules within four hours of going to bed and, for best results, the capsules should be used for 60 days alongside a healthy diet and exercise. There are a lot of positive reviews on Amazon, but many of them are longer than the norm and too many have before and after photos. One reviewer even provides a video testimonial. It’s all a little bit OTT and we have to wonder how authentic these reviews are. The negative reviews are somehow easier to believe. “The manufacturer makes these pills sound so good, but they don’t seem to do a thing. I bought 2 bottles. In 8 weeks time both of them were empty and nothing had changed. I can’t understand how this product has got so many good reviews. A number of customers reports experiencing side effects. Headaches and diarrhoea appear to be the two negative reactions most commonly reported and one user claims Ageless Kiss gave her a migraine headache three days on the trot, the last of which lasted the whole day through. With this in mind, we suggest all potential users get some professional input from their GP before making a final decision to buy and use this product. You can only buy Ageless Kiss from Amazon.com and the company only appears to offer postage to addresses located in the USA. The Amazon sales pages does not mentions a guarantee, but an easy-to-miss statement on the Raw Synergies website states anyone who experiences discomfort can contact the company for a full refund. The Raw synergies Website has no contact information at all and customer reviews suggest people who contact the company and ask for a refund via Amazon are simply ignored. 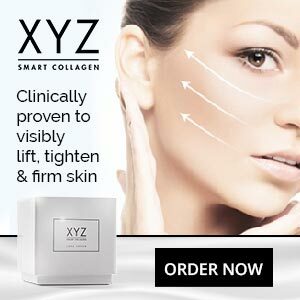 There are a lot of questions with this product, such as the level of experience the manufacturer has as a supplement supplier, where the capsules are produced (it could be anywhere), and if the Ageless Kiss customer reviews can be relied up for accuracy. Then there’s the question of the offer of a money back guarantee. Is Raw Synergies really likely to cough-up a refund if customers tell them the product made them feel unwell? Customer reviews suggest no. Will it do the things it’s supposed to do? It’s possible it may do some of them and it certainly has the potential to provide people with a healthy dose of antioxidants. However, Ageless Kiss is unlikely to be the wonder pill it’s made out to be and does not compare well to the female fat burners and pre-workout supplements we’ve reviewed elsewhere on this site. 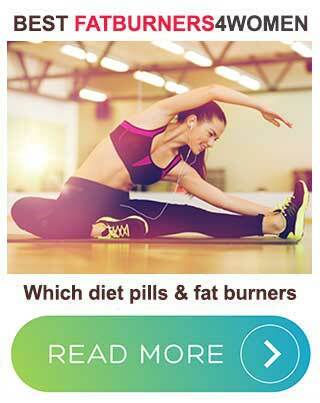 Our preference is for LeanBean – a dedicated female fat burner that target the reasons why women put on weight. 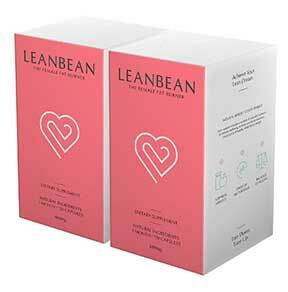 LeanBean has been positively reviewed countless times by many sections of the weight loss industry. The real tipping factor that LeanBean has over it’s rivals is it’s long refund period – 90 days.